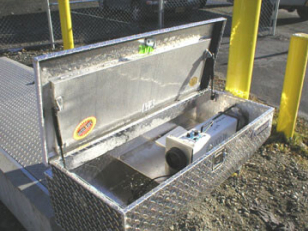 Ozone generators elimate odors from pump stations and lift stations. The ultra-violet light bulbs produce sweet smelling ozone which will elimate on contact any odor problem associated with raw sewage, trash hoppers, mold and mildew, animal odor, medical waste, food processing and most any noxious odor that is otherwise hard to eliminate. These Ultraviolet UV ozone generators produce ZERO nitrogen oxides, and the ozone output is unaffected by high humidity (two characteristics not possible with corona discharge ozone generators unless only pure oxygen is used for feed gas). 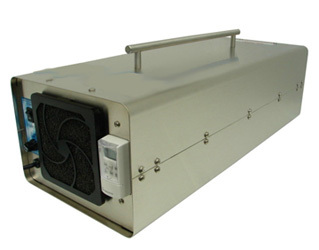 For Example, with just 50% humidity, this unit will produce as much ozone as a corona discharge ozone generator rated at 6,800 mghr. Ecologix OCO-Series ozone generators come in four models with ozone output capacity ranging from 550 – 6800 mg/hr. 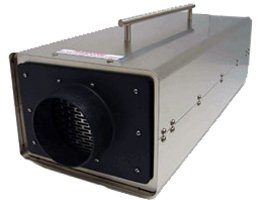 The OCO Ozone Generator series are used in a number of applications to eliminate bad odors on. 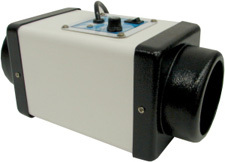 The OCO Series are most commonly used to eliminate odors associated with pump stations and lift stations. 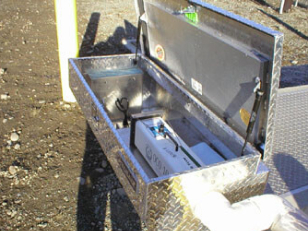 The illustration to the right depicts two common methods of installing an OCO Ozone Generator for eliminating odor produced by ordinary pump stations. Configuration (1) shows the ozone generator mounted to the outlet piping on the top of the pump station. This method uses a typical 4″ dryer hose to connect the ozone generator to the outlet piping in a “Y” configuration. As the air and odor rise from the pump station, the ozonated air intercepts the venting air and eliminates the odor on contact before it can exit into the atmosphere. Configuration (2) shows the ozone generator mounted on top of the pump station with the 4″ dryer hose being installed directly into the tank of the pump station. This method blows the ozonated air downward, eliminating the odor on contact before it vents through the pump station outlet into the atmosphere. Control options: On off rocker switch standard on all models 24 hour 1 shot timer (120 VAC only). The OCO Booster Fan will accompany any OCO Ozone Generator to assist in boosting the outlet power for applications that require extra force. 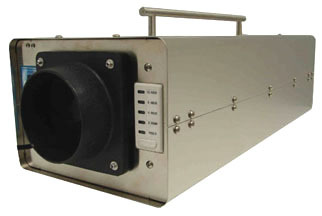 The booster fan can be used with a typical corrugated dryer style hose to generate ozone for several feet or several yards from the generator. Works great for circulating pump stations or any odor problem that requires the generator to ciculate ozone at a distance. The Ozone Generator that we purchased from you works great so far. 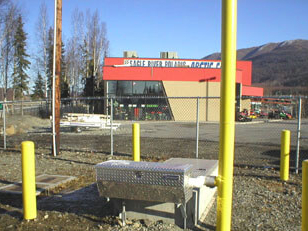 The unit was installed at a 550 gpm wet pit lift station. We built our own box to protect it from the elements. The two businesses next to the lift station were complaining about the odor. We tried several modifications. First we raised the vent pipe 12″, cycling the pumps more often, we then tried odor controlling liquids, but none of these seemed to work. 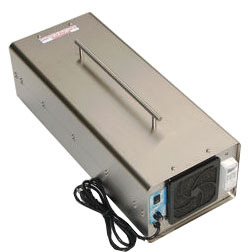 The OCO-10K Ozone Generator has been in service for three weeks now with out any complaints. We also installed a timer to start and stop (7:00am to 7:00 pm) 7 days a week. Licking County Wastewater Department operates several “open” type sewage pump stations. These pump stations consist of gravity sewage and STEP sewage. The STEP tank effluent is a septage tank product and creates Hydrogen Sulfide gas with a lot of odor. The County has always fed Ferrous Chloride in the past for odor control which never worked very well. The Summer of 2007 I decided to purchase an OCO Ozonator unit.The installation was very easy. We used Sch 40 PVC pipe to direct the Ozone flow into the wet well. The result was remarkable. Odor complaints were regular by the nearby homeowners. The complaints have stopped all together and we have discontinued the use of Ferrous Chloride. We have purchased a second unit and have installed it in the same fashion at another downstream pump station and it works great also.